The Junior Volleyball Association (JVA) is determined to create something special in Columbus – and they’re off to a rousing, action-packed start. The first JVA SummerFest at the Greater Columbus Convention Center (GCCC) attracted more than 320 girls’ youth teams from several states, including plenty of nationally ranked teams. About 3,500 athletes competed in the two-day event, that concluded Sunday, and at least 5,000 of their family members, friends and fans attended. All these volleyball-loving visitors are expected to spend at least $2.5 million. “We looked at Ohio as a huge hotbed for volleyball, and in order for us to grow our membership, we wanted to do something special in Columbus and get some visibility here,” said Jenny Hahn, executive director of JVA. That something special was SummerFest. It will be an annual event at the GCCC, which is in the midst of a large renovation and expansion project. A big chunk of quality was on display in the 15-and-under Open Championship match, which featured the Lorax of Munciana Volleyball, the nation’s top-ranked 15-and-under squad. They faced off against Mintonette Sports of Columbus, the No. 3 team. The match more than lived up to its billing. It featured plenty of above-the-net action, diving saves, wicked jump serves, tricky set plays, and lots of blocking. The Lorax won the first set 25-21, but the Mintonettes took the second, also by a 25-21 score. With the third set tied at 10-10, the calm, cool and experienced Lorax, whose players won the 14-and-under national championship last year, took control with some well-placed spikes just inside the line … and won 15-11. “We’ve been to a lot of JVA tournaments and we knew K2 (from Nashville, the Lorax’s semi-final opponents) and Mintonette are great clubs,” said Sarah Vance, coach of the winners. The Lorax were led by setter Melani Shaffmaster, a wily veteran who has already signed to play at the University of Minnesota. And yes, it is possible for a 15-year-old to be a wily veteran. Teammate Kenzie Knuckles is also among the top youth players in the country. The Mintonette’s strong showing was another step forward for local clubs, who have begun to make a name – and rankings – for themselves on the national stage. 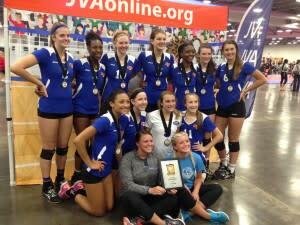 The 15-and-under Open Division wasn’t the only one loaded with nationally ranked teams. The 16-and-unders included four of the top 25 teams, and was won by the Milwaukee Sting. The 17-and-unders included six of the top 25 teams, and was won by the Tsunami of the Northern Kentucky Volleyball Club. The JVA is all about helping clubs such as Munciana and Mintonette attract more and more players, become better organized and be fiscally sound. “We are basically a trade association for volleyball club directors,” Hahn said, adding the JVA has members in 46 states, as well as Canada, Puerto Rico and New Zealand. Teams from Wisconsin, Tennessee, Kentucky, Michigan, Pennsylvania, New York, Illinois and Indiana competed here in SummerFest. “Because we’re a two-day tournament, we needed to look at a site where there are as many teams as possible from within a six- to eight-hour drive,” Hahn said. The city’s central geographic location, the facilities at the GCCC, and the long list of hotels and other nearby amenities made it the perfect location for SummerFest. NOTES: SummerFest is a continuation of the Year of Volleyball in Columbus. It has already included: USA Volleyball Girls’ Junior National Championships in January at the GCCC; the Ohio Valley Region (OVR) Kaepa Girls Volleyball Championships in May at the GCCC; the Ohio High School Boys’ Volleyball State Championships in May at Capital University. *Still to come: National Volleyball League Pro Beach Volleyball Tour, July 15-17; The NCAA Division I Women’s Championship at Nationwide Arena, Dec. 15 to 17; and the American Volleyball Coaches Association Annual Convention at the GCCC, Dec. 15 to 17. *You may have also noticed a lot – and we mean a LOT! – of youth athletes out and about Friday and Saturday. This is what happens when the Year of Volleyball collides with the Weekend of High School State Championships. They were everywhere: the OHSAA Track & Field State Championships at Ohio State’s Jesse Owens Memorial Stadium; the OHSAA Baseball Championships at Huntington Park; the boys’ and girls’ lacrosse championships at Thomas Worthington High.